Description: Lithops hallii is one of the most variable white flowering species related and often synonymized to Lithops julii (including Lithops fulleri). Furthermore it shares several characteristics with Lithops hookeri and Lithops salicola. This plant clumps up quickly and forms small clumps with up to 6 or more heads. It is relatively easy to manage like that where many other species would quickly kill themselves. Some people consider it one of the most tolerant of overwatering. Desmond Cole field number C087A (C 87a): This is a morphological variant distinguishes from standard L. hallii C087 for having dull grey leaves instead of reddish-brown leaves. This selected form has broad interlacing network of windows with mostly small islands and fairly distinct irregularly toothed margins. 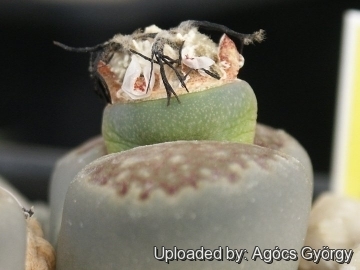 Cultivation and Propagation: The Lithops (a.k.a. 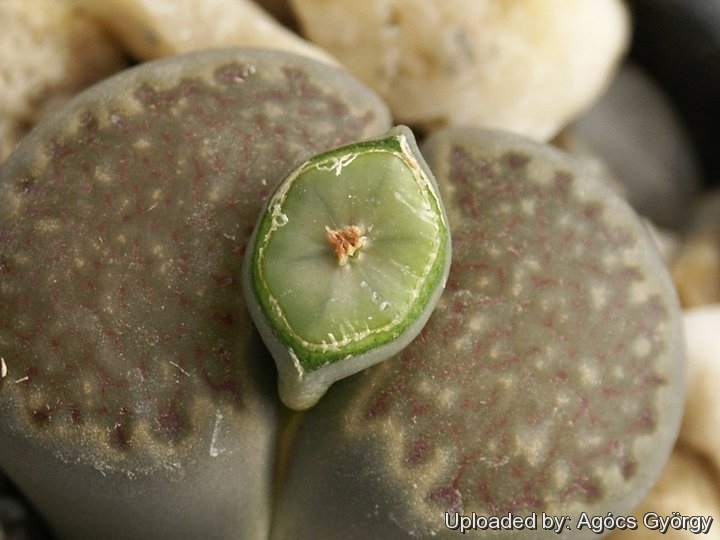 Living Stones) are some of the world's most fascinating plants and are sought by the collector of succulent plants. Being small plants, a representative collection can be grown on a patio table, a sunny windowsill or a shelf in the greenhouse. Fertilization: Feed them once during the growing season with a fertilizer specifically formulated for cactus and succulents (high potash fertilizer with a dilute low nitrogen), including all micro nutrients and trace elements diluted to ½ the strength recommended on the label. They thrive in poor soils and need a limited supplies of fertilizer to avoid the plants developing excess vegetation, which is easily attacked by fungal diseases. Some growers fertilize frequently, some hardly ever. However, for the highly succulent mesembs, (Lithops, Conophytums etc.) fertilization is not really necessary. Light: They prefer a very bright situation and in winter they need the maximum amount of light you are able to give them, but keep more cool and partially shaded in summer. Pests and diseases: They are vulnerable to mealybugs and rarely scale.